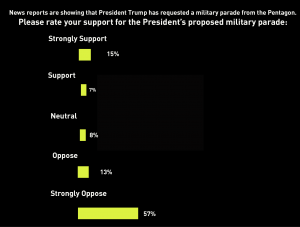 Emails were sent to IAVA’s members inviting them to participate in IAVA’s poll on a military parade. The poll was available for 24 hours, from 3 PM on 2/7/18 to 3 PM on 2/8/18. The results represents only data collected from the military and veteran community. 4,615 IAVA veteran members and service members participated in the survey with a 100% completion rate. The margin of error for this poll is +/- 1.4 percentage points at the 95% confidence level.